This is a circuit that I designed without using anyone elses schematic. I have tested it on a breadboard and it works perfectly . When designing this circuit, I wanted something which when I would turn of the switch, the circuit would run for a minute or so more. This would be idea for relays if they are controlling something like cooling. I personally plan to use this on water cooling my computer and using the relay to automatically start my pumps and cool a few minutes after I turn it off This can be done by hooking a computer power source (usb or power supply rails) to where the switch is and combine the grounds to create an automatic switch, but the circuit itself would require an external power source. The inductor is used to represent the relay switching mechanism and the led resistor is deturmined by the equation (input voltage - LED rated voltage) / LED miliamp usage in Amps, or you can use an LED caluculator which uses the same equation. The 10K ohm resistor can be swapped with a ohm values between 1k to 10k, but all must be the same unless you know how the circuit works. The lower the ohm value, the faster the circuit responds when switching from on to off, but it does use more power. If you want to increase the duration time, increase the capacitor's value or/and replace the 100k resistor with something of a higher value. The 100k resistor will work with lesser values too so using a pot would work if you want to vary the duration. 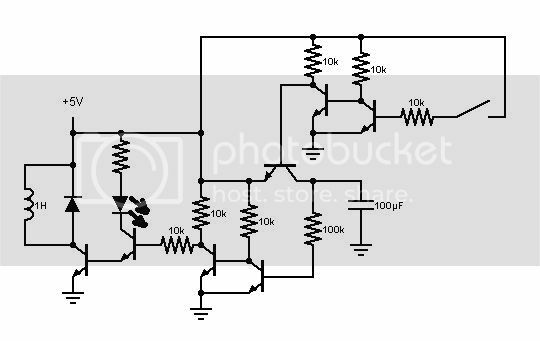 This circuit also can be used with higher voltages as long as the components are rated for the value, so it can easily go to 12 volts since most components are rated higher than that. It also was designed to charge fast and last for awhile on after the switch is turned off. The design itself includes several RTL inductors as amplifiers and isolating the inputs and outputs. This isolation is useful if you are going to make an switch using a different power source (see above) and eliminates the risk of one power source backflowing into the other. It is also is flexable with the resistors you can use (read above) so if you have a lot of the same type resistors of a single value, like my $1 stash of 100 x 10K resistors, you can use them.